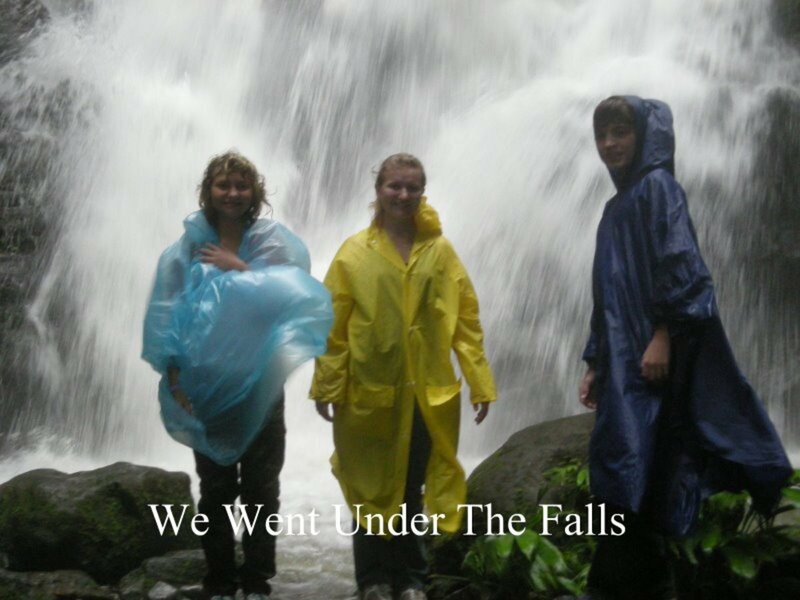 In the summer of 2010, five of my family members and I visited Costa Rica, and I’m so glad we did. This is a beautiful country between the Pacific and the Caribbean. 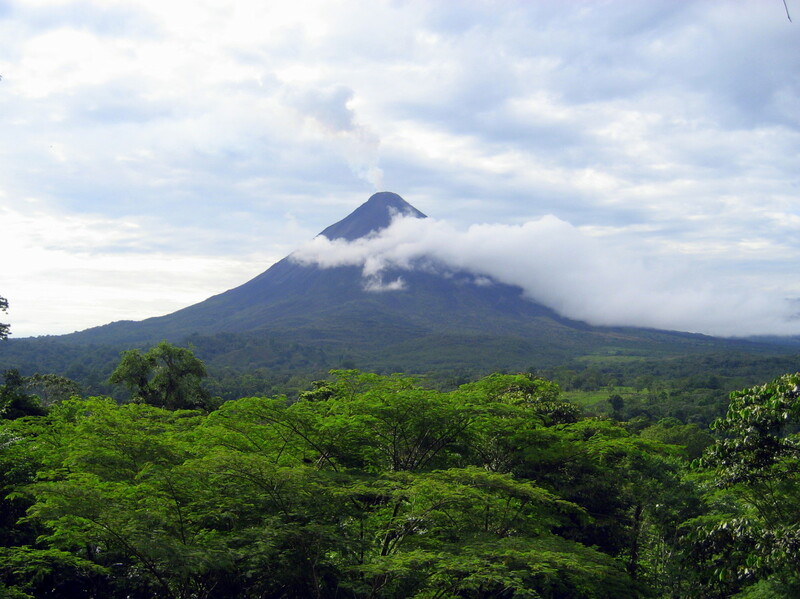 Costa Rica means “Rich Coast”, and it ranks first on the Happy Planet’s Index as the "greenest” country in the world. They abolished their Army in 1949. Since they have no defense budget, they devote their money to their people in the form of good education and health benefits. Costa Rica boasts a literacy rate of 94.9%. Bananas and coffee are their main exports. The climate of Costa Rica is tropical year-round. Tourism makes it the most visited nation in Central America. Medical tourism is attractive to Americans because of Costa Rica's proximity (a short flight), the quality of its medical service, and lower costs. The country has gained a good reputation in plastic surgery for these reasons, and now you see resorts devoted to the privacy of patients, affording them luxury while getting their procedure done. Costa Rica features an awesome variety of natural beauty. Nearly 12% of the country is devoted to the preservation of nature and wildlife, under the protection of the national park system. 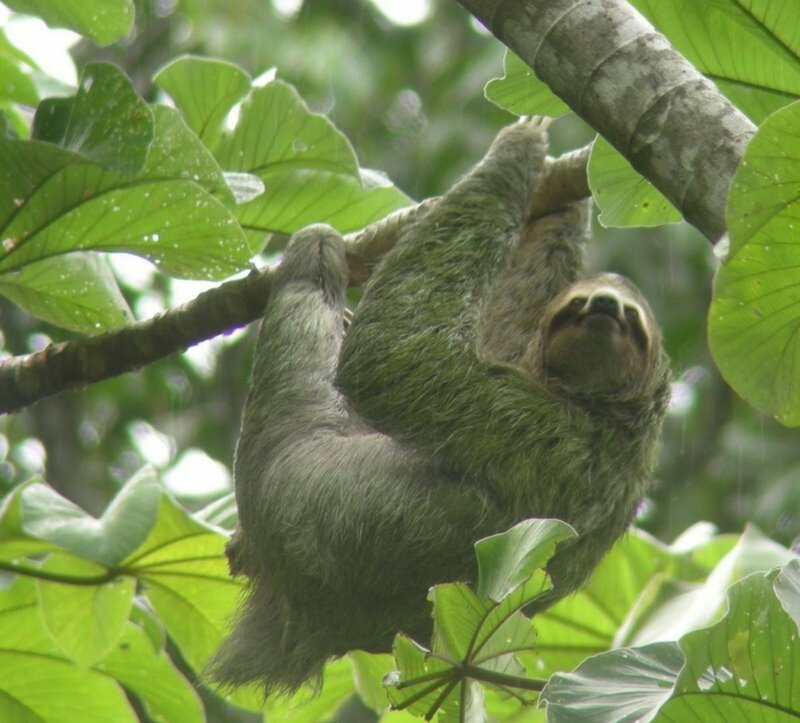 Costa Rica offers visitors a view of rare birds, turtles, animals, hundreds of species of ferns and orchids—so much so that it is often referred to as the “Garden of the Americas.” Other natural wonders include coral reefs, jungle scenery, and a range of active volcanoes reaching a height of 12,000 feet. 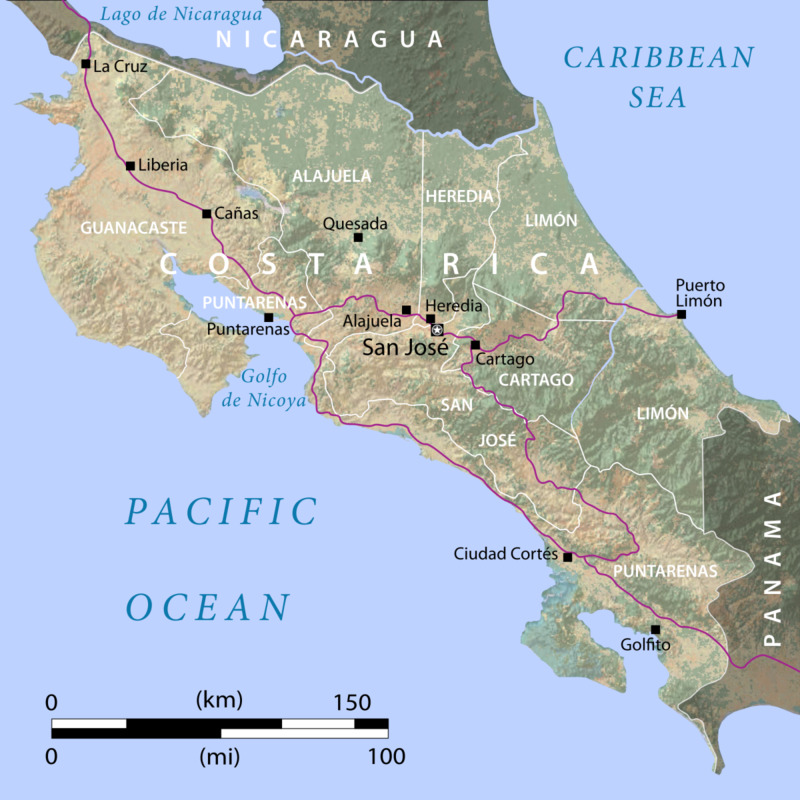 Costa Rica refuses to conform to stereotypes about Central American countries; it enjoys a stable democratic government, adheres to high standards of education, and is a relatively prosperous land. I was struck by the cleanliness of the people and the country. They are very friendly people. Since English is required as a second language, it is not difficult to converse with the local people. Their national food dish is gallo pinto, which is cooked rice and beans fried together. We spent nine days here in this beautiful place. I wish now we had planned for a longer trip. We flew out of Ft. Lauderdale, Fl. The flight only takes about two hours. When you first see Costa Rica from the air as you land, you see miles and miles of green, which I found out later are mostly coffee plantations, and of course, the rain forests. We were met at the Juan Santamaria Airport airport by our friendly tour director, who drove us to the lovely Hotel, the El Rodeo. We had a great dinner there, complete with native food. He would pick us up here in the morning to begin our fabulous trip. I took all the photos with my digital camera. Day Two: Early the next morning we began driving to the Poas Volcano area and what they call a cloud forest. The diameter of this volcano is one of the widest in the world. 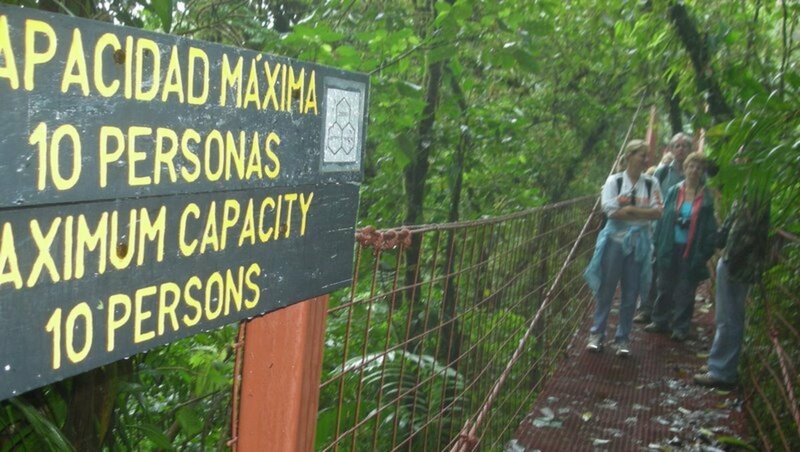 After that, we drove to the La Paz Waterfall Gardens, a Nature Park. We walked spectacular trails that led us to Magia Blanca Falls (the largest and the most spectacular of the falls in the area.) 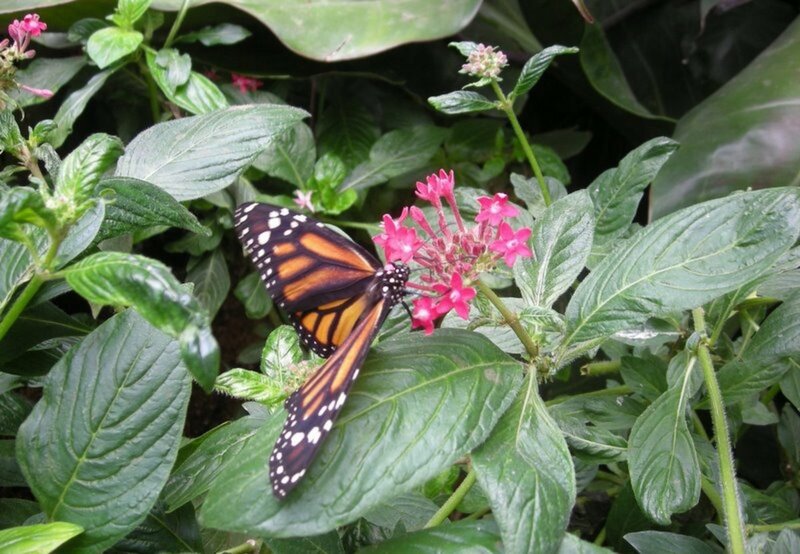 While at this park, we visited the largest enclosed butterfly observatory in the world. 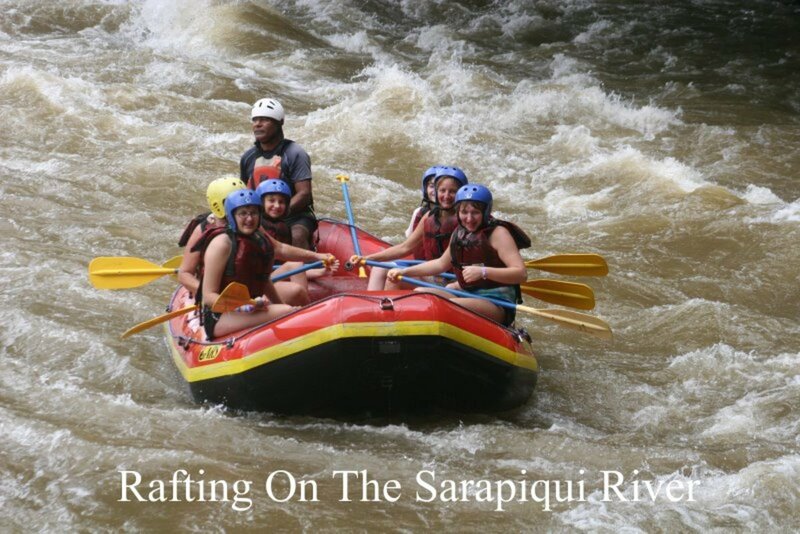 Day Three: Early in the morning, we headed off to do rafting on the Sarapiqui River. 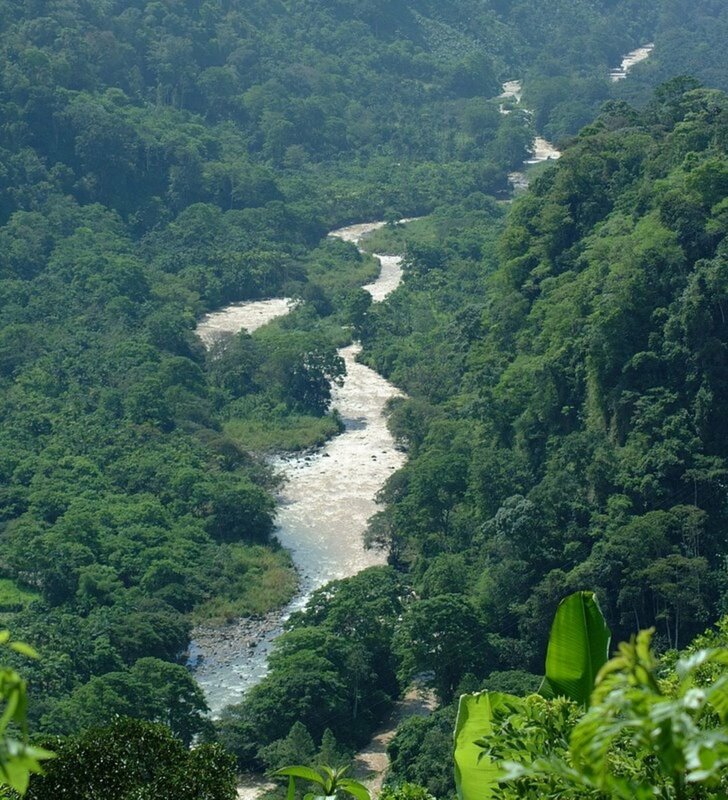 This river offers some of Cosa Rica’s most lush and vibrant scenery. Free-flowing, it has its origins in clear mountain streams that tumble down through thick rainforest, finally joining together in the crystal waters of the beautiful Sarapiqui. This narrow, low-volume river is ideal for white-water novices, as well as families, all of whom will enjoy its moderately flowing rapids. 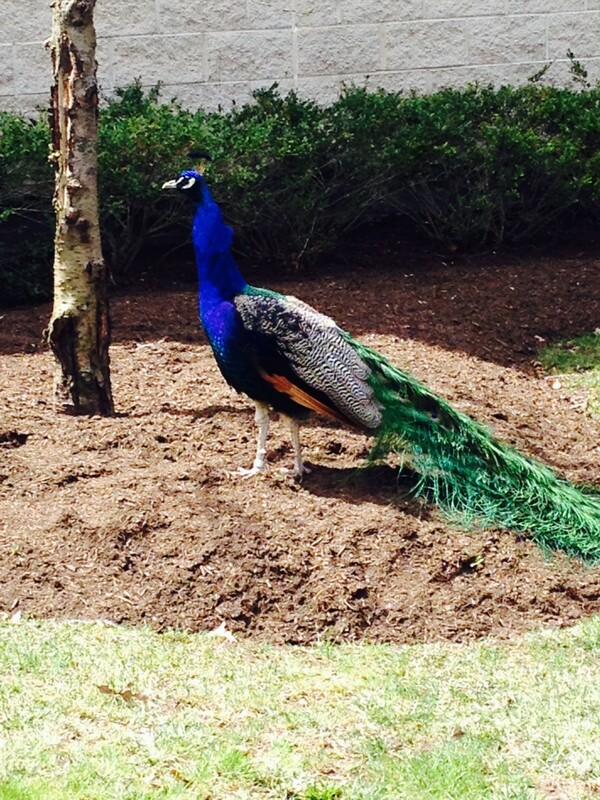 This journey is excellent for bird-watchers and nature lovers. You will see hummingbirds, toucans, woodpeckers, and scores of other native birds. Later that day we visited the Ecotermales Hot Springs. This is a wonderful place to just get into the warm water and relax. 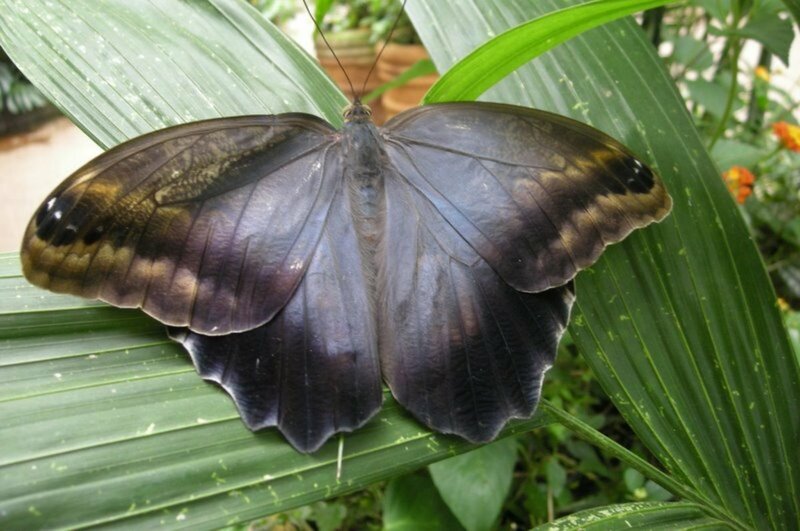 Day Four: We go to the Monteverde Cloudforest/Sky Trek and Tram and Nature Walk. We hiked through well-marked trails. 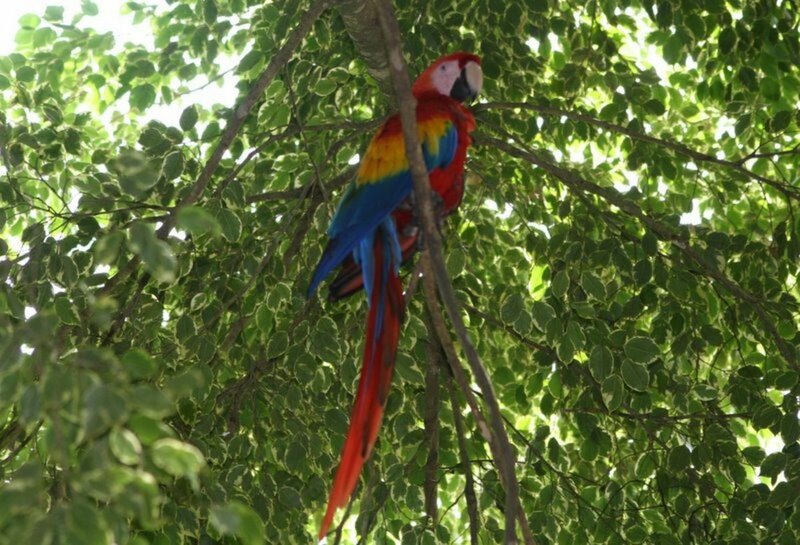 We spotted a Quetzal, a rare and beautiful bird, and one of the most beautiful birds in the world. We saw lots of monkeys and sloths hanging from the trees. We spent the night at the Trapp Family Lodge. 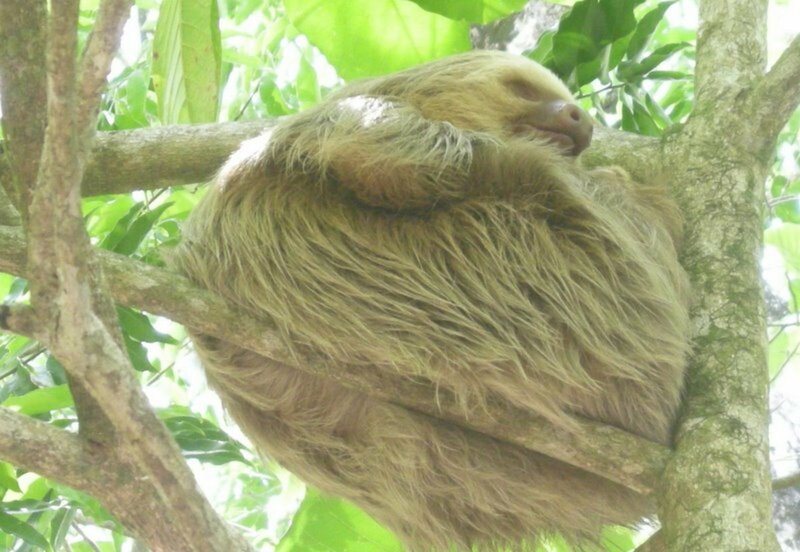 While we were on our hike, a baby sloth fell out of a tree, and our guide gently picked it up and placed it back on the tree where it firmly attached itself. This trip took us all day. Day Five: We’re up early and ready for the big Sky Tram/ Zip Line Tour. The view from the Sky Tram was amazing. You look out over the rain forest. The cable runs along the tree tops, and stretches 7000 feet. 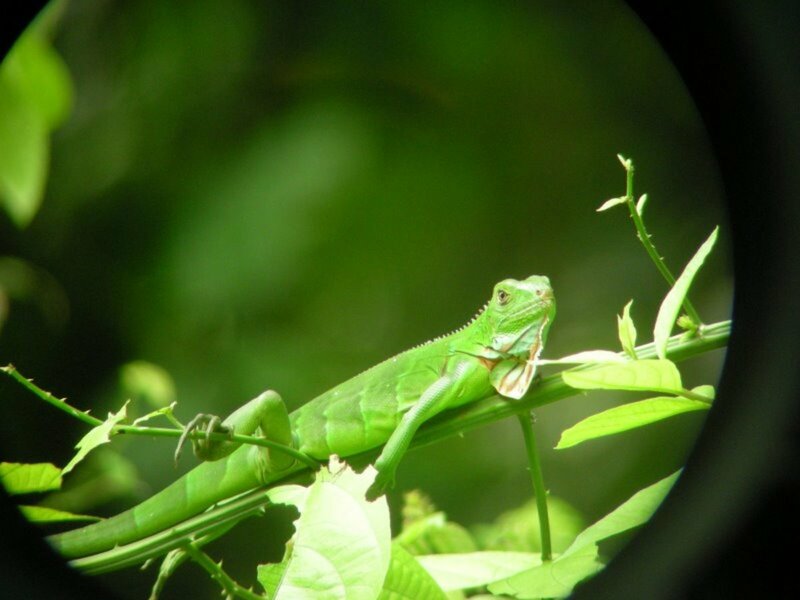 Here, you have the opportunity to observe and appreciate tropical forest from different vantage points. We then walked across a suspended bridge, called the Sky Walk. This bridge is 300 feet long and 66 feet high. This was a little unnerving, as the bridge swayed a great deal. 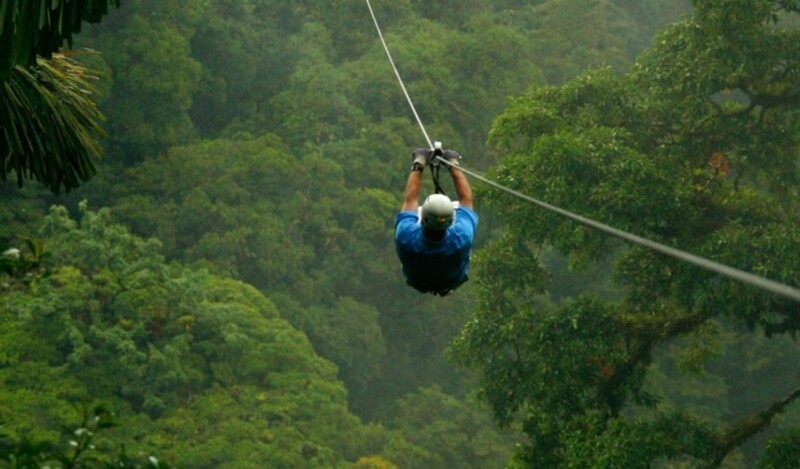 We also did the “Zip Line” which is cable strung high up in the canopy of the trees. There are platforms about 500 feet apart. They put you in safety gear, harness, helmet, etc. You have to sign a release that they will not be responsible for your safety, and that was a little alarming to me. The guides take you up by steps all the way to the first platform (which is quite a haul up). They make sure you are ready, and then they push you off. And, off you go….attached to the cable. You then zip along to the next platform. I screamed the whole way. There were some people who begged to do it again, but I did not. At the last platform, the only way down is to rappel down. I didn’t know what that meant until I had to do it. 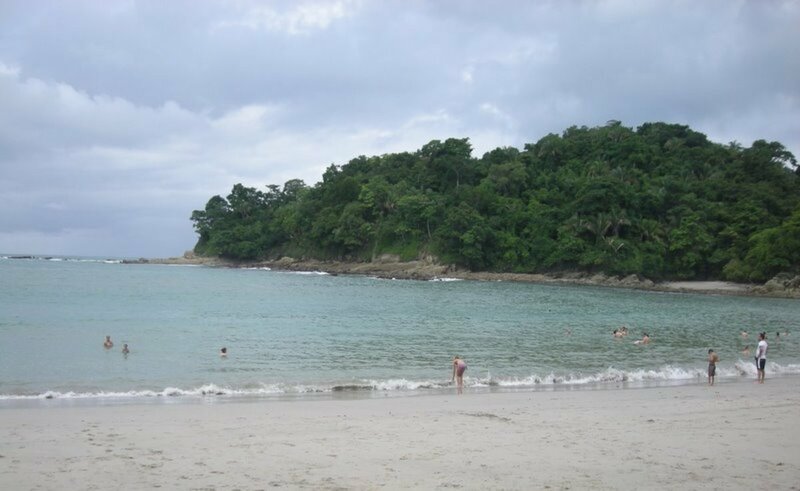 Day Six: This day we spent traveling for five hours to get to Manuel Antonio, Quepos. We were in a 4-wheel van. The driver didn’t seems to notice all the pot holes in the road. At one point, the road was completely washed out, but he didn’t even slow down! The drive was well worth it, though. We were tired after the long drive, so we ate a large Costa Rican dinner and went to bed. We stayed at the California Hotel. 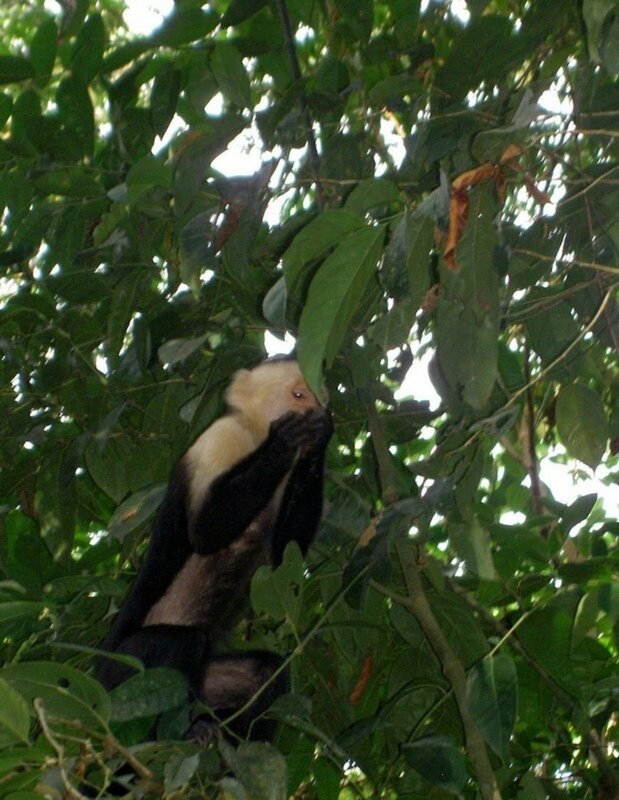 Day Seven: We got up early and headed for the Manuel Antonio National Park. An experienced guide took us through the park. He pointed out things of interest along the way. We hiked for 3 hours. This park is considered to be Costa Rica’s most beautiful park, with white-sand beaches ideal for swimming, and tropical rainforest alive with wildlife. 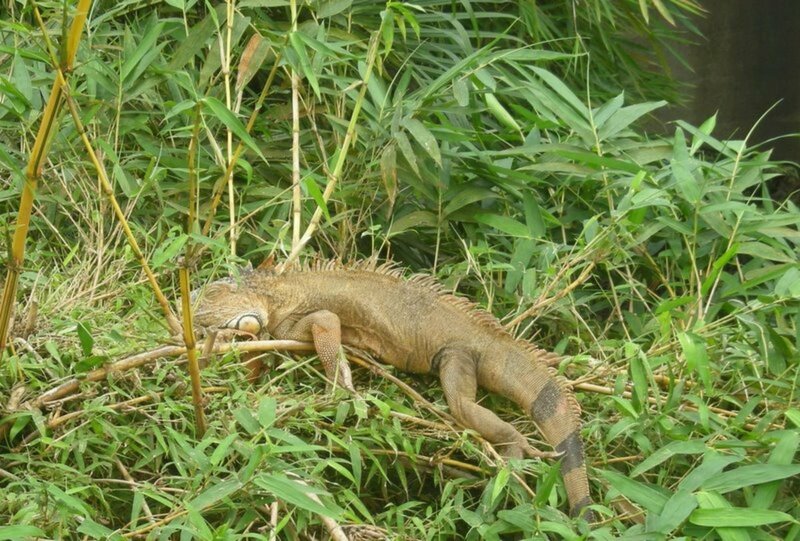 There were monkeys and iguanas everywhere. We were pretty tired after this trip. If you go to Costa Rica, invest in some good hiking shoes; you will need them. We just relaxed and went to bed early at the California Hotel. 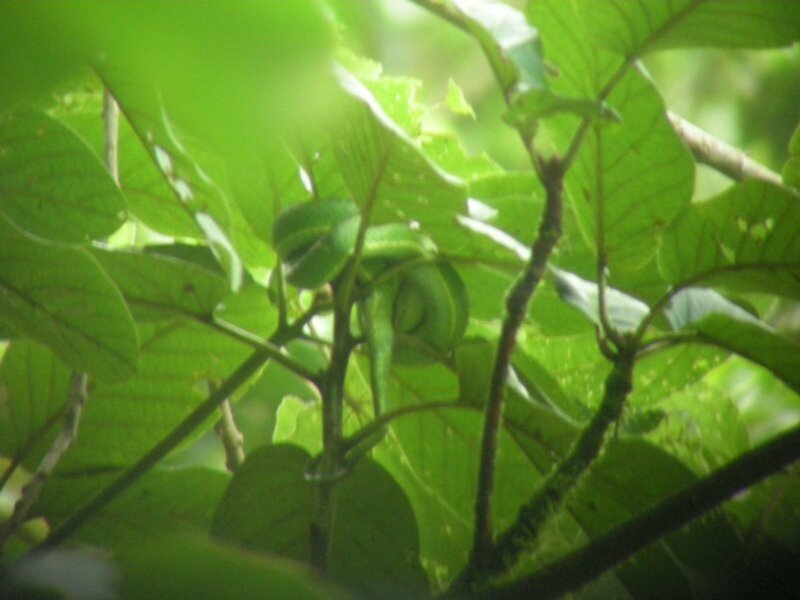 Can You Find the Green Snake? Day Eight: We were up early, had a good hearty breakfast of gallo pinto, and were ready to go Horseback riding. We really enjoyed the horses, and got the chance to get off and walk underneath some high water falls. That was a lot of fun. This activity took up most of the day. As usual, we were bone tired, had a great dinner, and went to bed. We stayed this night again at the California Hotel. Day Nine: We slept late for a change. We spent the afternoon on a kayak adventure through canals. We saw lots of wildlife on the side: white-faced monkey, sloths, snakes, crabs, and lots of birds. After this tiring trip, we went back to the hotel to clean up and have a huge dinner. We packed for our trip home. We have to say good-bye to this beautiful place. We all had a wonderful time, and would like very much to return one day. I can understand why so many Americans are retiring in Costa Rica. The cost of living is so much less that in the states, the government is stable, the people are warm and friendly, and of course, the main reason I’d like to live in Costa Rica is the weather. It’s warm year round. It gets a little cold up in the mountains, they tell us. We didn’t go up into the mountains. Another plus for me is that they keep the same time year round, no moving the clocks back and forward. 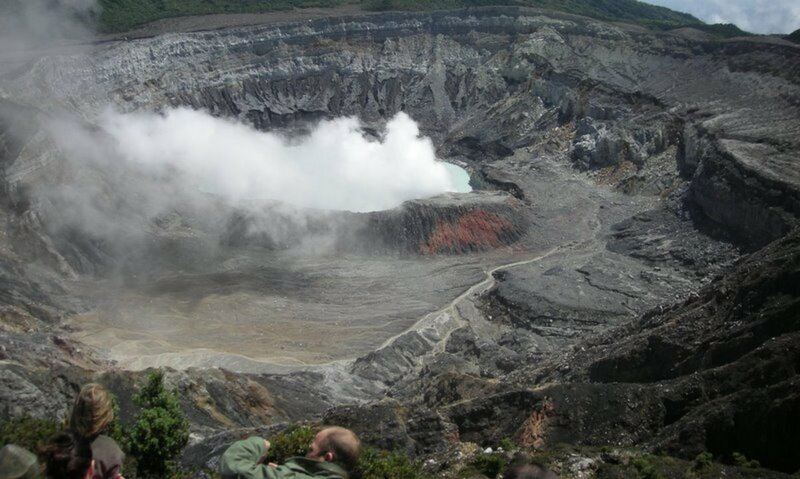 If you are thinking of visiting Costa Rica, I’d recommend you contact a tour company. You might think you will save some money by renting a car where you arrive in the capital of San Juan. I would discourage you from doing this. The roads in Costa Rica are full of pot holes; they don’t mark their streets very well. The natives say they don’t repair their roads because they don’t want a lot of traffic. The bus and cab systems are very good. 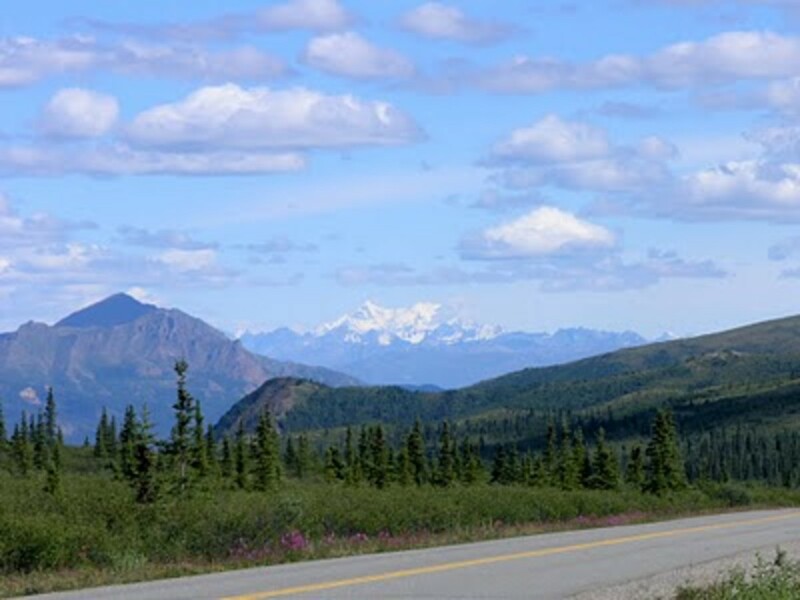 It is well worth the cost of hiring a tour company who will drive you around, buy all the tickets for the parks, and pay for the hotels and food. They will take care of everything from picking you up at the airport when you arrive, conducting all the tours, and they take you back to the airport for departure. These costs are all included in their fee. At the end of the tour, if you are pleased with the service you got, you are expected to tip your driver. 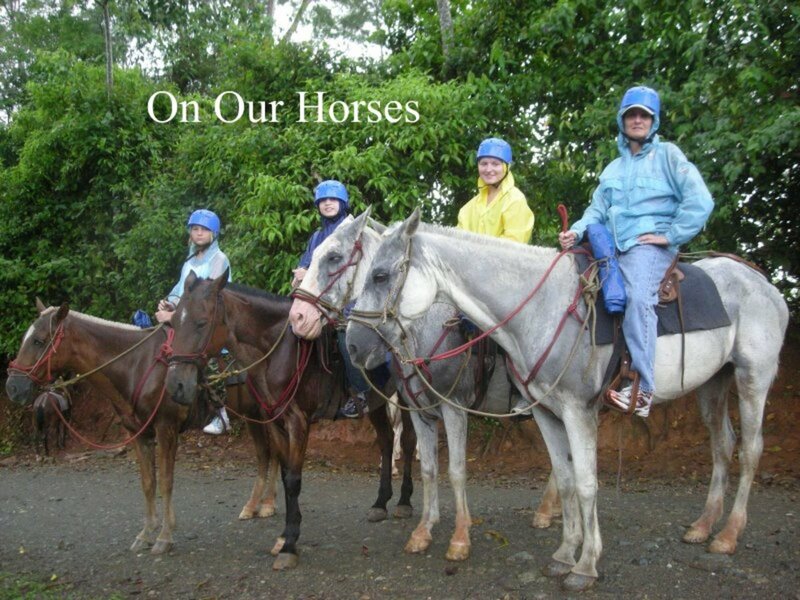 The tour group we used is called Costa Rican Trails, but there are many of these tour companies. Do some research on the internet to find them. I would also say everyone in your group should be in good physical condition because of the hikes. If you do have someone in your group that is not up to hiking, they could stay behind in the hotel, and let the more adventuresome do the more strenuous things. I would certainly recommend Costa Rica for a family vacation at any time of the year. I would advise people planning to go to Costa Rica to take a longer trip than we did. If I go again, I will take a two-week tour package. The country is small, but you just can’t do it justice in eight days. The two-week tours take you from coast to coast. Hi, CrisSp. I'd love to return to Costa Rica some day. I really loved the country, the people, everything about it! I do hope you have an opportunity to go back soon. Thanks for reading, commenting, and for the nice compliment on my photos. Mary, I've read part of this earlier and have to return to complete it. San Jose is full of excitement. I've been there (and Liberia) but didn't really get the chance to explore the wonders of the place. Perhaps, this year. But, I enjoyed this hub immensely. 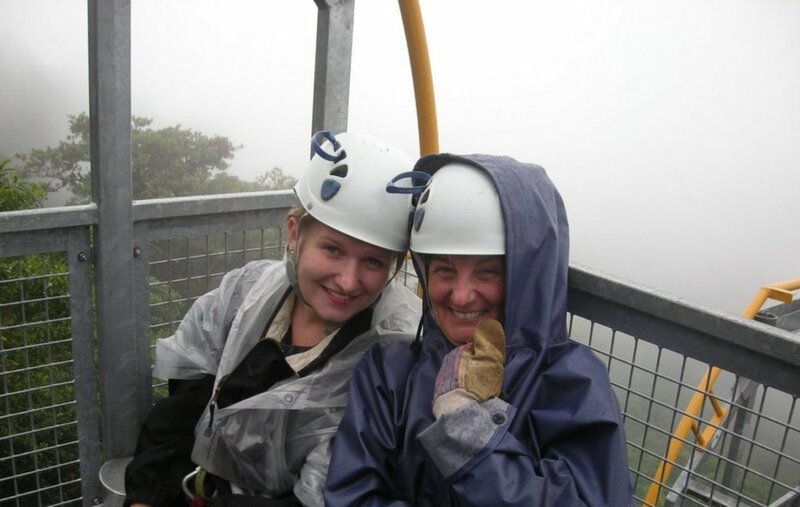 Your photos are stunning and you are so cute in the cable ride shot. Thanks for the wonderful trip! Hi, Smart Alex. It's nice to meet you today. Yes, Costa Rica is a beautiful place; I'm sure you would love it. I also wrote a Hub comparing CR to Puerto Rico because I like both places. I invite you to read my Hub also. Great article, Ill definitely put on the list of where to head to next. 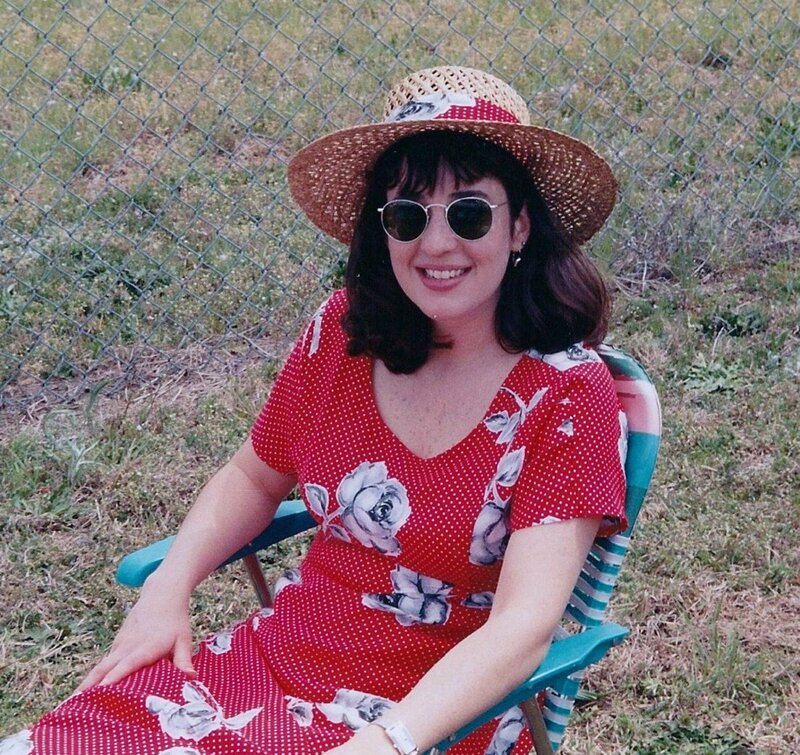 Hi Deborah, thanks for reading my Costa Rica Hub. I enjoyed your Costa Rica Hub, too. It truly is a beautiful country. I'd love to go back there some day. I had seriously thought of trying to do some volunteer work there. There are a lot of opportunities to do that. Thanks for your link, too. I love this, Mary! Your photos are spectacular. You hit some of the places I wanted to see but didn't have time to get to. This is a great resource for travelers and a good complement to my article. Between the two of them, people will have a great overview of the many things to do and see in Costa Rica. I will link to your article from mine, and many thanks for doing the same! Hi bdegiulio. 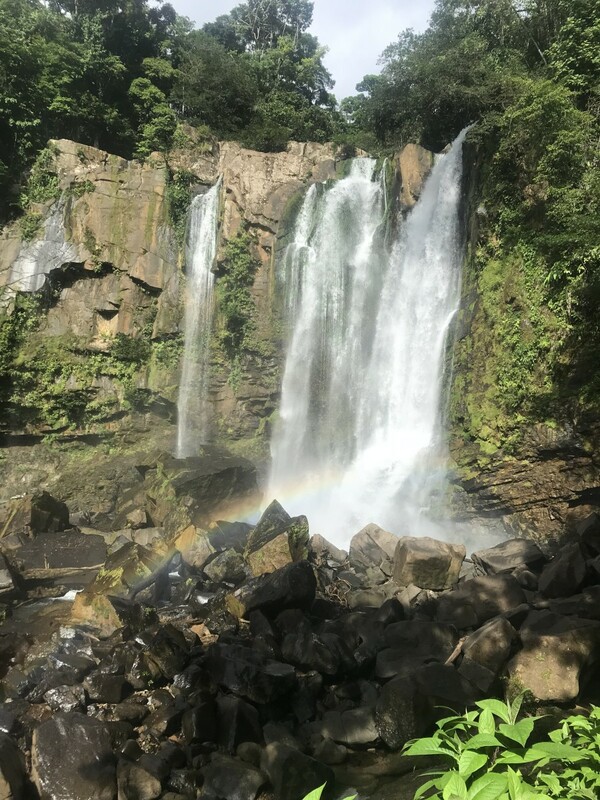 Thanks so much for reading and taking the time to comment on my Hub about Costa Rica. It truly is a beautiful country. I'd like to go back someday. I do hope you will make it there someday, too. What a great Hub. Very informative and wonderful photos. I'm looking forward to visiting Cost Rica someday. Thanks for sharing. 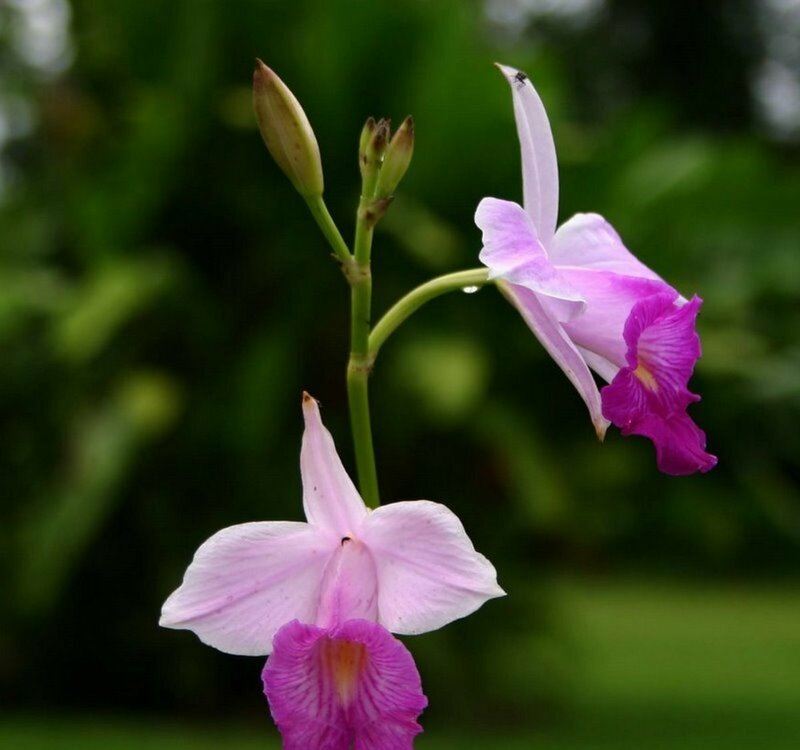 Hi Peggy W. Thanks for coming back and sharing my Hub on Costa Rica. I'm still hoping to go back some day. I came back so that I could hit the share button with my followers + tweet this. Anyone considering a trip to Costa Rica should visit this hub. Thanks for sharing your wonderful trip with us. Hi, Living Well Now. Thanks for taking the time to read and comment on my Hub about Costa Rica. Thanks for the nice compliment on my work, I appreciate that. CR is truly a beautiful place, I'd love to go back. Bye for now. This is a very nice hub. Costa Rica is on my short list of must-see travel destinations. I really like your use of mixed media and your photographs are beautiful. Nice travel journal...well done! A complete guide about Costa Rica. 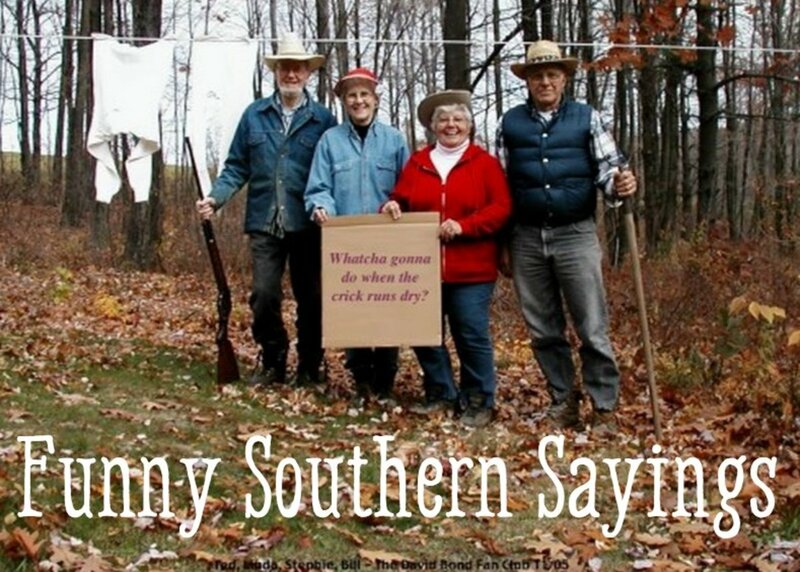 Thanks dear mary615 for posting this. Hi, Rusti Mccollum, nice to see you. Thanks for reading about my vacation in Costa Rica, so glad you enjoyed it. Thanks for the compliment and the vote, too. I hope you and yours will have a wonderful Christmas. Regards. I just HAD to say how much I enjoyed your pics of Costa Rica! I have been enjoying a lot of your articles etc. You are very talented, voted up .Merry Christmas! Good Morning, Deborah Brooks. Thanks for reading about our vacation in Costa Rica. I really wanted to go there again this winter, but I don't think I'll make it. Thanks for the compliments, and the votes! Oh Mary I would love to go to Costa Rica... IT is so beautiful there.. the pictures you took are awesome... thanks for sharing you did a great job...I voted up and awesome..
Hi Sueswan, I did that zip lining thing ONE time; would never do it again. I was scared to death! Thanks for reading and for the votes. Goodnight. I haven't been to Costa Rica but everyone that I know who have gone really enjoyed it. You are braver than me. I would have not have gone zip lining. Good Morning, Eiddwen, Thanks for reading and for the nice compliment. It is truly a beautiful place on earth. I'm an arm chair traveler, too. Not by choice, though. What a wonderful hub mary. I really loved it and have to vote up plus bookmark into my 'Armchair Travelling'slot. Hey, LudieRVgirl! Do hope you will go to CR someday. Don't go in your RV, though....you'll get wet! Must be a lot of fun traveling in an RV! Thanks for the compiment. Goodnight. Mary615, I have always wanted to go to costa Rica. My husband and really like traveling in the RV. I do hope to go one day. Great pictures Good job! Hi "f" Yes it was my first visit to CR. Hope it won't be my last. It's a wonderful country, full of wondrous things to see. Thanks for your nice comment. Interesting hub. Was it your first visit, maybe? Blessings. Hello Mary, what a wonderful experience, holiday in Costa Rica, wow! The photos are amazing, I would love to go one day. Hi HBN: I look forward to your email. Thanks for the compliment. Coming from a Pro. like yourself, that means a lot to me. Hope you have a wonderful day! I sent you an email in regards to your question. Looks like this hub is getting rave reviews which certainly doesn't surprise me. It's a great travel pictorial. It is a dream of mine to visit Costa Rica someday. Your wonderful hub just stimulates that desire even more. It does sound as though one needs good broken in hiking shoes to keep up with all of those various activities like you so successfully did. I would probably scream the entire way, as you did, on a zip line experience. Loved this as well as your photos. All the votes up except funny. Hi susan54, words just cannot describe the beauty of this place. That's why I want to go back! It really was a lot of fun. An unforgettable vacation. Goodnight. Hi richardmohacsi, good to see you! Thanks for the nice compliment on Costa Rica. Could you tell I fell in love with the place???? Bye for now. drbj, you were so lucky to make the trip across the entire country. That's what I want to do next time I go. So glad to bring back happy memories for you! Thanks for the vote, too. Goodnight. I can relate to your hub. Great stuff, it does Costa Rica justice. This is beautiful, Mary, it reminded me of my own trip to Puntarena, San Jose and Puerto Limon - across the entire country. The rain forests were amazing and there were monkeys everywhere. In the trees, that is. Thanks for bringing back all those lovely memories. Excellent hub. Voted up. Pamela99, first of all, let me say I'm so glad to be following you! You really should go back to CR and spend more time there. It is a remarkable country. They value their natural resources, and I like that! Thanks for the vote, too. Bye for now. This is a fantastic hub about Costa Rico and your pictures are terrific. We spent just one day there while on a cruise and went to the rain forest and rode the trams in the canopy. I noticed the cleanliness of the country also. I would love to return, even more now that I have read you wonderful hub. Rated awesome and interesting! I was waiting for this hub and it fulfill my expectations. Excellent hub with awesome pictures and explanations. I think this hub will be among one of the nominees for main prize as i see that you tagged it as contest. good luck my friend. rating it up, awesome, beautiful and interesting. Hi, Gypsy! Thank you SO much for the lovely compliments. Yes, please come back again. It truly is a marvelous place. Bye for now.. Such a wonderful hub. Would like to see Costa Rica. The photos are great and love those animals. Will bookmark this one to read over again. Wow! You did a fantastic job on this hub! Loved the comprehensive information and you are far too modest about your photography skills- you had many beautiful shots here that made one want to rush out and see this lush country. Voted up across the board except for funny. This was awesome. Good Morning, SweetiePie, yeah, money stands in my way of going places, doing things! I'm an armchair traveler! CR really is a great place, I want to go back!Hope you have a wonderful day. 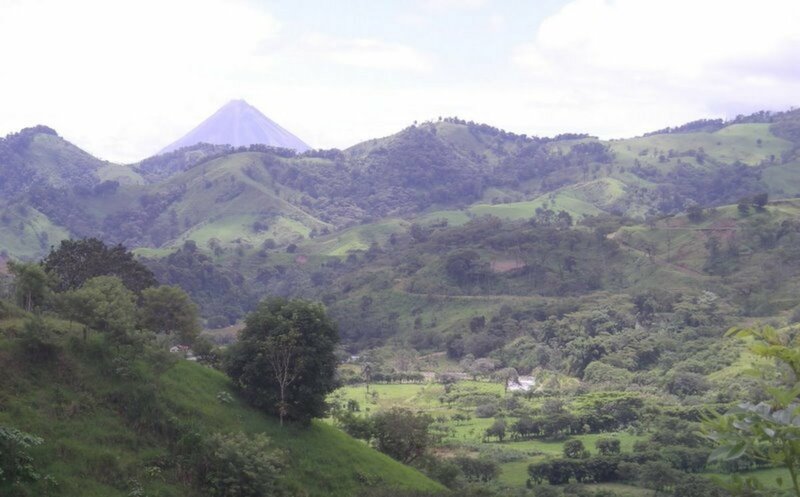 What a beautiful country Costa Rica is, and I would love to go there if I had more money. Gee, I would love to go more places if I had more money. Hi Agnes Penn, Thank you for the nice compliment on my Hub. CR really is a beautiful place. If I could, I'd like to live there. I fell in love with everything there. It was a great experience! Good night. Thanks marcoujor, thanks for taking the time to read this, and for the nice compliment on my work on this. We have so many Hubbers who do such a beautiful job with their photos, and I feel like such an amateur! Glad you found the snake! Those look at us like we are intruders! Thanks for the great vote, too. I am so happy for you that this trip was possible. Traveling the world is a dream of mine. The photos are gorgeous; I love the sloth. 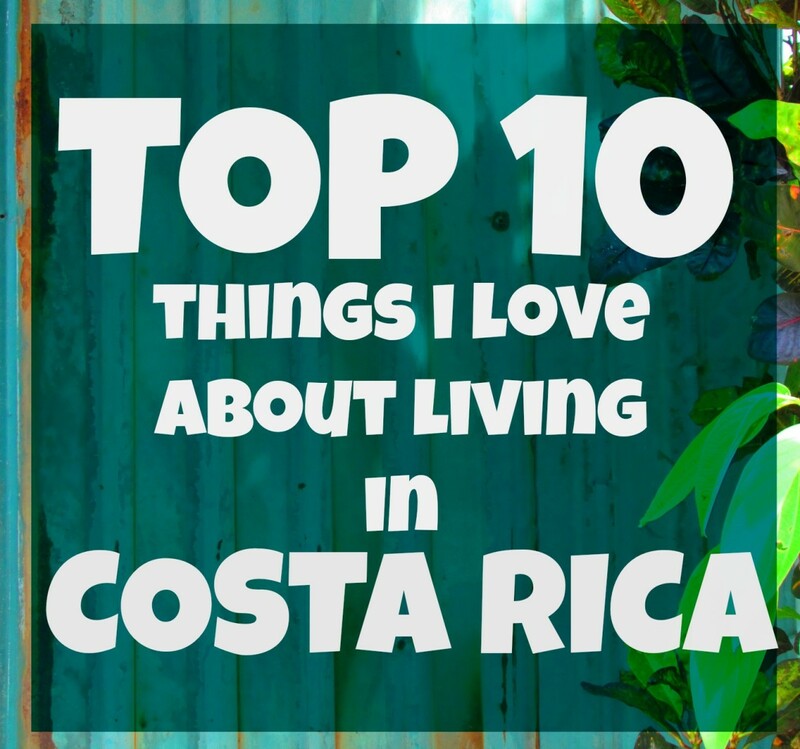 Your information about Costa Rica is something I would read again before going there. You did a great job on this Hub. Beautiful country, Mary, and beautiful hub! I've heard many good things of CR. I'm glad you enjoyed it. You did a fabulous job with the layout and presentation of this informative and visually appealing hub. You and your family look like you are having the time of your lives! The monkey is precious and I found that illusive snake! Good luck with this excellent work-- voted UP & UABI, mar. Why hello there, MP50. Good to hear from you. Costa Rica really a beautiful country, I can't say enough. The rafting was great, a little scary, but great fun! My kids never thought I could keep up with them hiking, etc. but I did. Nearly killed me, though! Take care friend, hope you aren't freezing!!! will have to go one day...what's the rafting like?